If you’ve been using BackupAssist for a long time, and the drive you installed it on wasn’t the largest to begin with, you might be finding it’s starting to outgrow it. Your BackupAssist installation folder will become larger over time, primarily because it stores reports and diagnostic files in the program data folder. Why not just delete old reports? Well you could, and that will help as a quick fix but it will only stop the problem temporarily. 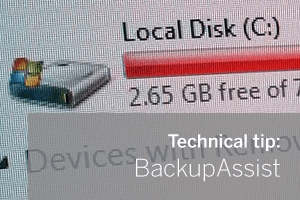 The developers are aware that some more options would be useful here to better manage this, but in the meantime, here’s a simple workaround you can deploy to reclaim that space by moving BackupAssist to a different drive which takes up most of the space. Step 4) Start BackupAssist to use the new location.